BitFenix Merc Alpha: Just How Much Can $39 Buy? While we've had a chance to check out a few cases in the $200+ club and the majority of the enclosures we've tested have floated around the $99 price range, we haven't really put the screws (so to speak) to a truly budget case. That changes today, when we tackle the least expensive case we've yet tested: the BitFenix Merc Alpha. At just $39 it would be reasonable not to expect much, but as you'll see this case can hang with enclosures at twice the cost or better. BitFenix has generously provided us considerable lead time to check out the Merc Alpha ahead of other sites, and the time was well spent. The Merc Alpha is one of a pair of twin models under the "Merc" brand; the Merc Beta has the same shell and costs the same amount, but loses the top vents. Given our generally positive experience with the Shinobi (another budget contender), I was looking forward to sitting down with the Merc Alpha and I wasn't disappointed by it. Drive Bays External 3x 5.25", 1x 3.5"
Internal 6x 3.5", 1x 2.5"
As you can see the bones with the BitFenix Merc Alpha are pretty bare, but I was pleasantly surprised at just how much functionality BitFenix was able to pack into it. The Merc Alpha has plenty of room for adding fans and improving cooling much like its older sibling, the Shinobi, and indeed the internal design of the Merc feels in many ways like a Shinobi that's lost some weight and some zazz. 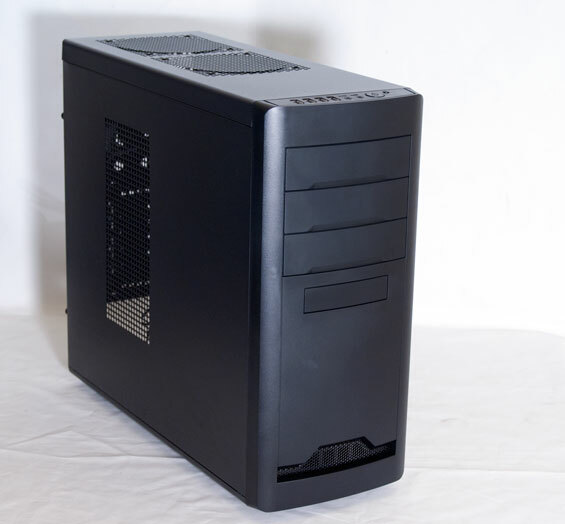 This is really a nice looking case (although I prefer a solid, rather than vented or windowed, side panel). None of the gaudy, flashy bits that usually mar inexpensive cases.